Facilities: FCI La Tuna with an adjacent low security satellite prison and a minimum security satellite prison camp. 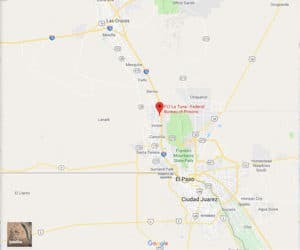 Location: FCI La Tuna is located on the Texas/New Mexico border, 12 miles north of the city limits of El Paso, off I-10 on State Highway 20. Background: FCI La Tuna was opened in 1932. The prison was originally called the El Paso Detention Farm and is located on the Texas-New Mexico border. Former inmate Bob Jones, an El Paso businessman (sentenced to 10 years for corruption and fraud), was known for writing letters to his family that were intended to warn loved ones to steer clear of misdeeds and illegal behavior, as the consequences were unbearable. A series of Jones’ letters were published in the El Paso Times, and were known as the “Letters from La Tuna”. Jones died of a kidney failure due to contracting E. Coli from the prison. Notable inmate, George Jung, (convicted of conspiracy and drug trafficking) had his life story depicted in the Johnny Depp film Blow in 2001. Jung was a member of the Medellin Cartel and key player in the cocaine trade in the U.S. during the 1970’s and 1980s. Jung was responsible for up to 89 percent of the cocaine smuggled into the United States. Housing: Inmates are housed in two-person cells and open dorms with four-person cubicles. The camp houses inmates in dormitories. Health Services: All inmates at FCI La Tuna are provided health care services including medical and dental sick call, emergency medical and dental treatment, medications, eye exams, and eyeglasses. Emergency medical care is available 24 hours a day. Psychology Services: Psychology Services provides basic mental health care to inmates. This care may include screening, assessment and treatment of mental health and drug abuse problems, individual and/or group counseling, psycho-educational classes, self-help and supportive services, and referral to Health Services for medical treatment of a mental illness. Individual programming recommendations can also be made. Residential Drug Abuse Program (RDAP): FCI La Tuna houses a Residential Drug Abuse Program (RDAP). The satellite low and the camp do not house a Residential Drug Abuse Program (RDAP). All La Tuna facilities provide a Drug Abuse Program, the Drug Education Class, and the Non-Residential Drug Abuse Program (NR-DAP). Education Services: FCI La Tuna provides literacy, GED, and English-as-a-Second Language (ESL) programs. Incentive awards are provided to recognize inmates making satisfactory progress and successfully completing the literacy (i.e., GED and ESL) program. Graduation ceremonies recognize GED, ESL, and Occupational Education completions. A parenting program is also available. High school diplomas and post-secondary programs are available through paid correspondence programs. Advanced Occupational Education: FCI La Tuna offers advanced occupational education in HVAC, Microsoft Office, and Office Technology. The satellite low offers Microsoft Office and Office Technology. The camp does not offer any advanced occupational education. Vocational Training: FCI La Tuna offers vocational training in Auto. The satellite low offers vocational training in Office Technology, and the camp offers vocational training in Building Trades, Auto, and Welding. Apprenticeship: No apprenticeships are offered at FCI La Tuna. Library Services: The leisure libraries offer inmates reading materials including periodicals, newspapers, fiction, nonfiction, and reference books. An interlibrary loan program with local, state, and college libraries and available bookmobile services is also available. The TRULINCS Electronic Law Library allows inmates access to legal materials and an opportunity to prepare legal documents. Inmates also have access to typewriters and a copy machine. UNICOR: The FCI La Tuna UNICOR facility handles fleet management and vehicular components. Commissary: Inmates have a monthly spending limit of $360.00 and items must not exceed the available storage space in the inmate’s locker. Inmates may spend a maximum of $120.00 per week excluding stamps and phone OTC medicine. Inmates may not possess more than one watch, one radio, one photo/scrapbook, or one MP3 player. Recreation Services: Indoor and outdoor activities at FCI La Tuna include organized and informal games, sports, physical fitness, table games, hobbycrafts, music programs, intramural activities, social and cultural organizations, and movies. Art and hobbycraft programs include ceramics, leatherwork, models, clay, mosaics, crochet, knitting, sculptures, woodworking, and lapidary. Wellness programs include screening, assessments, goal setting, fitness/nutrition prescriptions and counseling. The recreation yard, located behind UNICOR, consists of three handball courts, a racquetball court, a basketball court, multipurpose court, soccer/softball field, a volleyball court, and a quarter-mile run/walk track.